Keeping love in the air long after Valentine’s, our annual February FiverFest is back, starting Wednesday 15th until Tuesday 28th February 2017. From pampering to food, wine, gifts or homeware, the offers are an eclectic mix of firm favourites. 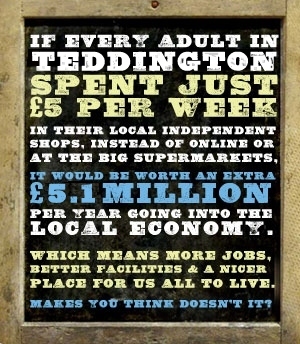 Grab a map from Heirloom or The Card Collection and explore Teddington to enjoy these great offers. Special thanks to illustration by Rachel Morris Illustration and sponsor printing by Instant Creations. Cavan Bakery; Lunch Offer for £5 – (any filled specialty bap, cold drink or crisps or cake) 25 High St – 0208 9431683 , 42 Broad St – 0208 973 3900 , 111 Stanley Rd – 0208 973 0923. Simply Skin; Selection of £5 mini products or £5 skin solvers, 68b Broad St, 0208 9771220. 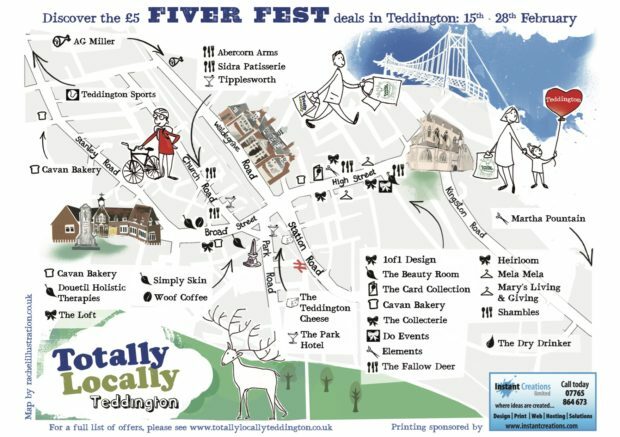 Teddington Cheese; Another firm #Fiverfest favourite. Buy £8’s worth of cheese and pay just £5. Cheeses included are Stilton & Puzzone (“Big Stink”). 42 Station Rd, 0208 9776868. Teddington Sports; Great selection of Wacky Sox at just £5 (usually £9.99) 226 Hampton Road, 0203 475 2025. The Abercorn Arms; A bowl of home-made soup, any baguette, panini or wrap and a soft drink for just £5. 76-78 Church Rd, 0208 943 9484. The Beauty Room; £5 file & varnish (hands) or £5 eyebrow shape (less than 1/2 of usual price). To book with Hayley call 0208 977 0262. 104 High St, c/o Shape Hair. 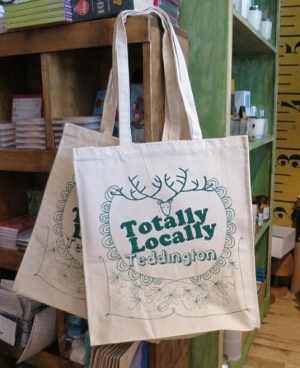 The Loft; ‘I ♥ Teddington’ jute bag at just £5, usually £7.99. 16 Broad St, 0208 973 0800. Tipplesworth; Cocktail goodie bag – includes mini bottle of spirit of your choice (Chase vodka, Sipsmith gin, Blackdown vermouth or Woodford reserve bourbon) cocktail cherries in kirsch & a sugar syrup. All for only £5 (usually £10). 12 Church Rd, 0208 894 3411.